LE ROUGE - La Pologne. LE ROUGE, G.L. - La Pologne. La Pologne. - LE ROUGE, G.L. Size : 8.0 x 10.6 inches. / 20.2 x 26.8 cm. Description :Fine map of Poland. George Louis Le Rouge was active from 1740- till 1780 as a publisher, and was appointed engineer for the King of France. From his Atlas Nouveau Portatif à l'usage des militaires et du voyageur... 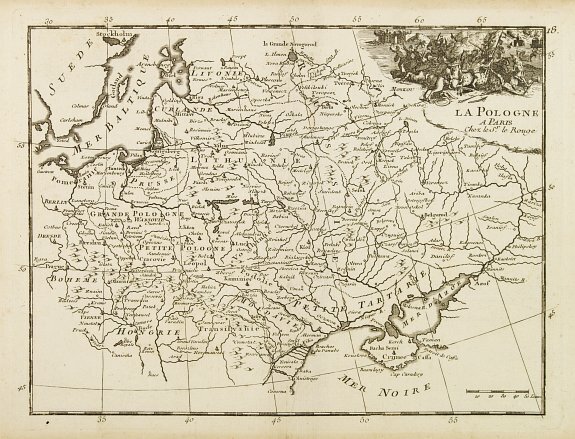 The atlas was dedicated to le Comte de Maurepas, and was sold by Le Rouge, Prault, Robinot and Briasson in Paris. Condition : A good impression. Marginal water staining on the left and right borders. A vertical crease right to the center fold. Good condition.